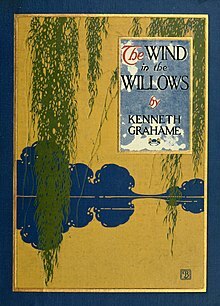 The Wind in the Willows is a children's book by Scottish author Kenneth Grahame. It was published in 1908. It is about four animals (a mole, rat, badger and toad) throughout their adventures in the English countryside. ↑ McCrum, Robert (9 June 2014). "The 100 best novels: No 38 – The Wind in the Willows by Kenneth Grahame (1908)". The Guardian. Retrieved 27 November 2017. Wikimedia Commons has media related to The Wind in the Willows. This page was last changed on 27 November 2017, at 09:25.